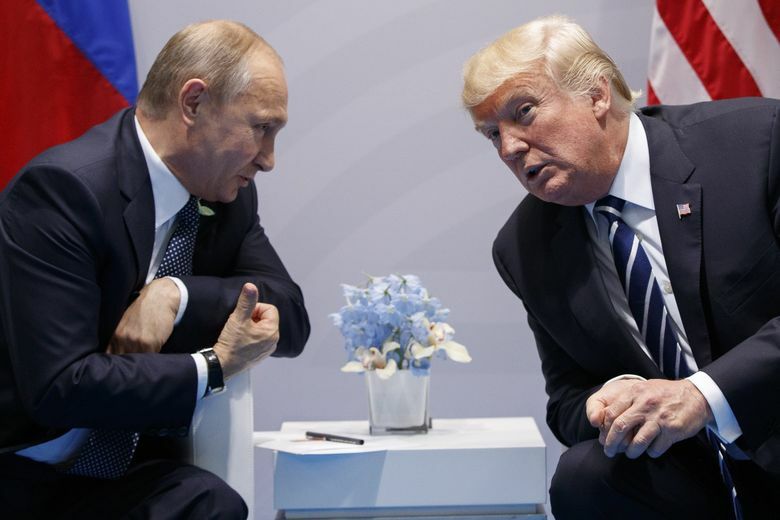 WASHINGTON – President Donald Trump did not follow specific warnings from his national security advisers when he congratulated Russian President Vladimir Putin Tuesday on his reelection, including a section in his briefing materials in all-capital letters stating “DO NOT CONGRATULATE,” according to officials familiar with the call. The president’s conversation with Putin, which Trump called a “very good call,” prompted fresh criticism of his muted tone toward one of the United States’s biggest geopolitical rivals amid the ongoing special counsel investigation into Russia’s election interference and the Trump campaign’s contacts with Russian officials. Although the Trump administration has taken a tougher stance toward Russia recently – including new sanctions last week on some entities for election meddling and cyber attacks – the president has declined to forcefully join London in denouncing Moscow for the poisoning of Sergie Skripal and his daughter Yulia in Salisbury this month. They remain critically ill.
Trump told reporters that he had offered his well wishes on Putin’s new six-year term during a conversation on a range of topics, including arms control and the security situations in Syria and North Korea. White House press secretary Sarah Huckabee Sanders told reporters that Skripal’s case was not discussed. Information on Syria and North Korea were also provided to the president in writing before the call, officials said. “We’ll probably be meeting in the not-too-distant future,” Trump said of Putin, though Sanders emphasized that nothing was planned. But Sen. Bob Corker, R-Tenn., chairman of the Senate Foreign Relations Committee, appeared less concerned, noting Trump has also offered congratulations to other leaders of more totalitarian states. “I wouldn’t read much into it,” Corker said. The notecards are similar to the one Trump was photographed clutching during a White House meeting with students and parents after the mass shooting at Marjory Stoneman Douglas High School in Parkland, Florida, officials said. Trump’s failure to raise Moscow’s alleged poisoning of the former Russian spy in Britain risked angering officials in London, who are trying to rally Britain’s closest allies to condemn the attack. Russia has denied involvement in the March 4 poisoning, but the attack has badly damaged British-Russian relations and British Prime Minister Theresa May last week announced the expulsion of 23 Russian diplomats in retaliation. Asked about McCain’s criticism, Sanders noted that the leaders of France and Germany also called Putin this week and pointed to former president Barack Obama, who congratulated Putin on an election victory in 2012. Asked whether the Trump administration believes Russia conducted a “free and fair” election, Sanders said the administration is focused on U.S. elections. Senate Majority Leader Mitch McConnell, R-Ky., also distanced himself Tuesday from Trump’s congratulatory remarks. Trump has largely refrained from criticizing Putin amid the ongoing investigation into the 2016 election meddling by special counsel Robert Mueller III, who in February indicted 13 Russian nationals on conspiracy charges. His tone has at times been at odds with his administration, which has taken stronger actions to counter Russian aggression, including Trump’s authorization of new sanctions against Russia and additional support Ukrainian troops in their fight against Russian-backed forces in Crimea. Trump’s applause of Putin’s victory was in line with other congratulatory calls he has made, including to Turkish President Recep Tayyip Erdogan for winning a much-disputed referendum that increased his already autocratic powers and to China’s President Xi Jinping for his “extraordinary elevation” after Xi last month engineered the Communist Party’s elimination of presidential term limits. “I think it’s great. Maybe we’ll have to give that a shot some day,” Trump said in a closed-door speech to Republican donors at his Mar-a-Lago Club in Florida several weeks ago, a recording of which was obtained by CNN. The Washington Post’s Karen DeYoung, John Hudson and Jenna Johnson in Washington, and Anton Troianovski in Moscow, contributed to this report.